Smooth blend of jazz and funk that gives you something to listen to while you bop your head. 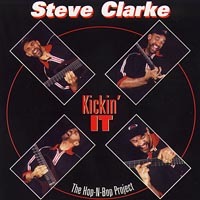 Steve Clarke's CD "Kickin'It" is a joy to listen to, but is also known to make people bop their heads and say um-hmm. The music is very uplifting of the spirit, blending funk, soul and jazz in a nature and fun way. All songs written by Steve and him being a bassist the songs are built from the ground up, you know they have a foundation and they groove! The bass is also featured playing melody/solo on 5 tunes. He plays a 6 string with 2 higher strings than the standard 4 and has no problem being melodic or getting around the bass. The CD also features guest artists: Rohn Lawrence - guitar ( Boney James,Will Downing) Jonathan DuBose - guitar (Harry Connick Jr.) Paul Mills - drums (Najee, Chaka Khan) Ken Gioffre - sax (BB King, John Patitucci) Vocals by Yvonne Burgess and Mike Mizzy. This CD is not only the one you want to tell people about, you want to get them a copy to make their day. Steve is an excellent basist if not the best one. Brilliant music ideas acompanied with fantastic base bubbling. It is hard to find a competition. Thank you Steve and hope to see again in Opava, Czech Republic soon ! great cd! alot of hot bass playing by steve. if your into stanley clarke, marcus miller, stuart hamm than buy this right away. you will not be disappointed. this guy can jam!